Coming in at a solid 2 hours, Adiwiraku is veteran TV director Eric Ong's heavyweight debut. Based on the real life story of two "Teach for Malaysia" teachers who teach English to their students in a kampung school, it follows their preparation to win the local district's English choral speaking competition, while dealing with the students' social and financial needs. 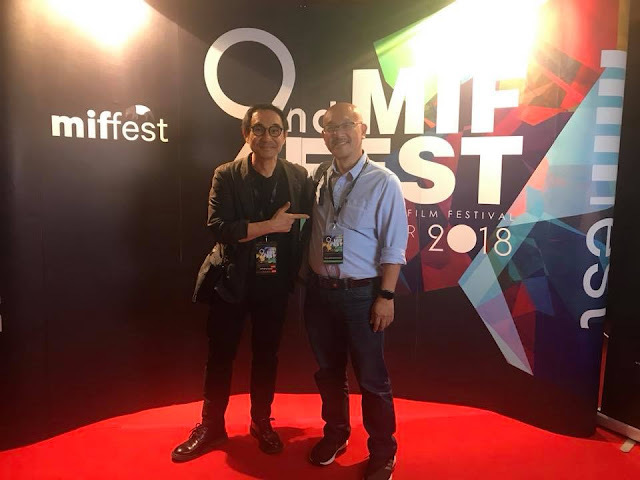 This film won several awards including ‘Best Film’ at last year’s 29th Malaysian Film Awards and was screened again last week at the 2nd Malaysian International Film festival. Eric is already working on Adiwiraku 2. Here is the scoop in our interview with Eric. Congratulations on picking up several awards and screening at several places. Where were some of your most memorable screenings so far? The most memorable screening would be the gala premier night where audiences sit through the entire credit roll and followed with a standing ovation. This was rare as normally people would just leave the hall after the story finishes. What make me happier was that the audiences were from the industry players and such recognition was very heartfelt. Secondly, screening in 30th TIFF (Tokyo Internation Film Festival). you could see how much the audiences appreciated each movie being shown at the event. The level of audience maturity was high. Why did you think of having the real students act as themselves? I was at that time wondering how to recruit like 35 young actors age 14-17 to group them together and train them choral speaking. Firstly it was hard to get 35 or more of the young actors, secondly, the amount of time needed to train them choral speaking is obviously hard. So we decided to audition the real student and see if they have talent in acting, eventually it turns out good, they really have talent hence we made up our minds to have all the student to play the roles There were 3-4 characters played by others but still they were students not actors. How did you work with the students in terms of acting? Did you face obstacles in terms of drilling deeper into their personal stories since these were real stories that were going to be put on screen? Good thing was who can played better than themselves playing their own roles, it could be the most realistic and natural. I need to tell them not to act but to be themselves all the time. Secondly we have intensive session to brief them about film production, everybody's role, who is director, what does he do?, who is assistant director , DOP, make up artist etc. The do's and don'ts in a film set, expectation, ethics, mannerism, and etc. after that, we taught them about blocking, favourable to camera, speaking the dialogues , run through script reading, let them analyse their own character, they will came back to tell me that "they are not like that" then I asked them "not like that then like what?" basically, the whole process was amazing and this was the first time I am my executive producer took this approach and experimented it. eventually it works though. What were some of the biggest challenges you faced in the making of the film? To be honest, the entire production was so smoothes that I can't believed it. WE have gotten so much support from the villagers, school and people around. If there were challenges , time was our challenge, we only have a very short window for filming, that was during the 1 week school holidays in March, plus weekend we have like 10 days to shoot in school and 3 more days outside the school. Secondly was the budget, because we did not get any funding , basically I funded the whole movie myself, from production to A&P, luckily I have Iceberg Design Malaysia (The Post House) to support the post production. If I have more budget and time, I could have improve on the production design and OST and sound enhancement. What was the reaction of Cheryl Ann Fernando towards the film? When we told Cheryl that we would like to made her story in to movie, she could not believe it. But she saw that we were very serious about it and she gave us her consent. She has been involve all the way in helping us to contact the students, convinced them, helping us with the school permission etc. And for the final results, she was happy to see that we were actually being very honest to the real story and did not exaggerate nor dramatise it too much. It was a very truthful piece of work. How did the kids acting in the film react to the final product? You are a veteran director for TV and have plenty under your belt. What types of stories interest you as a director? Personally, I like crime stories, especially those that will reflects humanity, stories that dig deep into human psychology. Are you working on your next film? What is it about? Yes, currently working on Adiwiraku 2. but it is not a sequel. I would like to retain the branding Adiwiraku as the title only means "Superheroes" and under the branding I will have more stories of superheroes in every individual who did humankind greatness.